The oldest mention of the town of Radenci dates back to 1436, when it was referred to as Radein. Our hotel was named after this early variation. The Hotel Radin is distinguished by a drinking lounge with a spring of natural mineral water. From the hotel, guests have direct access to the thermal world, the health centre and the wellness centre. The hotel restaurant offers a selection of healthy dishes. Treat yourself to a break at a health resort with a beneficial climate! The Hotel Radin is a health resort hotel with 290 rooms. The rooms are situated in two wings – the B wing houses newer rooms, while the rooms in wing A are somewhat older but renovated. There are nine room types in total. Some rooms have air conditioning and some have a balcony. The hotel offers direct access to the thermal pools, buffet restaurant, health centre and wellness centre. Zdravilišče Radenci is located near Gornja Radgona, near the Austrian border in the northeast of Slovenia and close to the motorway. Arriving on the A5 Pomurje motorway (Maribor–Dolga vas), take the Sveti Jurij ob Ščavnici exit. At the junction, turn left towards Radenci. The road leads through Kapelske gorice to the roundabout in Radenci. 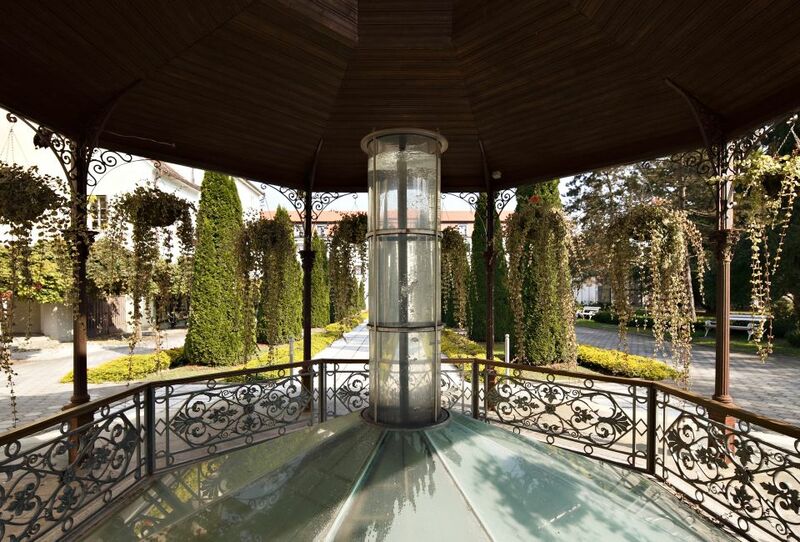 At the roundabout, take the second exit, which will take you to the Hotel Radin parking area on the left. It is 165 km to Ljubljana, 265 km to Trieste, 415 km to Venice, 485 km to Munich, 665 km to Milan, 255 km to Klagenfurt, 355 km to Salzburg, 220 km to Vienna, 305 km to Budapest, 135 km to Zagreb and 525 km to Belgrade. The bus stop is 500 m away and it is 7 km to the railway station. Maribor Airport is 50 km away. 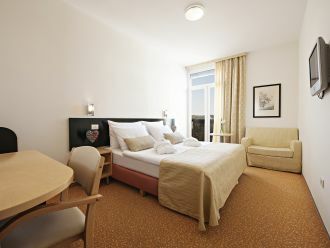 Comfortable double room with a 200 cm wide bed or two separate 100 cm wide beds. The room (23.5 m2) features a bathroom with bathtub and toilet as well as a desk and sofa chair. 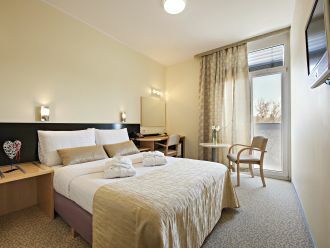 Comfortable double room with a 160 cm wide queen-sized bed and balcony with a view of the park. The room (16.5 m2) features a bathroom with bathtub or shower and toilet as well as a desk. Comfortable double room with a double bed 200 cm wide or twin beds 100 cm wide and park view. The 23.5 m2 room features a bathroom with a bathtub with shower and toilet, a writing desk, a balcony and an armchair. Comfortable suite with a 180 cm wide bed or two separate 90 cm wide beds and balcony with a view of the park. The room (60 m2) features a bathroom with shower and toilet as well as a desk and chair. I am a regular visitor of Hotel Radin. Even though the room facilities are basic the experience you get is amazing. The staff is friendly and at your disposal every moment. The SPA is really one of the best. The various pools , safety and entertainment in the SPA is on the highest levels.The food is very good and there are a lot of choices. The clossenes of Maribor is greta so you can hop off and enjoy the beuties of this lovely city. You must visit the surroundings as there are a lot of beutifull places to visit around Radenci. 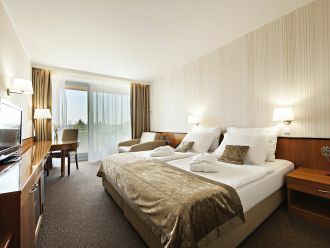 I highly reccomend Hotel Radin as a destination for relaxation and enjoyment. We went to Radenci Spa and Hotel Radin to spend a long weekend there. The receptionists are very nice, trying to help you as much as they can. The room we had was an economy double room, it didn't have the balcony, but that is reasonable, taking the economy class. We had the AC, which was perfectly OK. The room was clean, bathroom is also big enough. The food was very good and tasty, there is a big selection of everything. The menus are built by the nutritionists. The spa area is big and clean, It offers a 25 meters swimming pool and an area where you can soak in. Saunas are also a part of the spa area. You get free access to all the areas with the hotel card (but saunas are free only until 16:00).